Is this replacement key fob a little too easy to program? Replacing a key fob usually involves contacting your dealership who then needs to place a custom order. 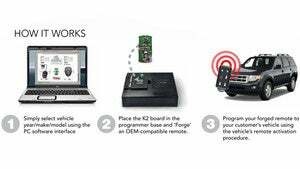 But the K2 fob works like a universal remote for vehicles, requiring just their make, model, year and about five minutes of programming. The third-party replacement fob not only means faster turnaround times for customers—minutes instead of days—but it also allows dealerships to tap into the lucrative replacement remote market without requiring them to stock fobs for every make and model they sell. And since the K2 fob can be programmed to operate up to two vehicles, it should even help lighten keychains. - For security reasons the programmer base unit is only sold to businesses involved in automotive security, and in addition to requiring an authorized account with KeylessRide the company also requires their business license, industry license, and even does background and credit checks depending on the services they want to offer. - The universal fobs that are shipped to business offering the KeylessRide service arrive blank and unable to access any vehicle. And in order to program them the company has to use the software provided by KeylessRide which can only be launched after they've logged in with their username and password. - Once the vehicle's year, make, and model have been specified, the fobs are programmed with one of hundreds of thousands to millions of encrypted rolling codes. It then needs to be paired which requires access to the inside of the vehicle. Depending on the make and model the process can require an existing working key in the ignition, access to the OBD2 diagnostics port, or even an alphanumeric code. - When the vehicle has been successfully paired to the new fob the programming and pairing procedures ensure it will only ever work with that specific vehicle, even if a similar make and model are within range.